In 1900 Edgar Nusbaum, the fourth child of Ernst Nusbaum and Clarissa Arnold, was living with his wife Viola Barritt, their daughter Celina, Viola’s sister, and a boarder at 1520 North 12th Street in Philadelphia. Edgar was working as a clerk, and Celina was a dressmaker. Celina was nineteen years old. On November 30, 1904, Celina married Hamilton Hall Treager Glessner in New York City. He was the son of Oliver Glessner and Anna Leidigh of Philadelphia. His father was a printer. In 1900, Hamilton was nineteen and still in school. On the 1910 census, Hamilton’s occupation was reported to be an electrical engineer. On March 10, 1906, Celina and Hamilton had a daughter, Marian La Rue Glessner. Unfortunately, the marriage did not last. By 1910, Celina and her daughter Marian were living with Celina’s parents, Edgar and Viola, at 707 Electric Avenue. Edgar was working as a clerk for the “steam” railroad, and Celina was working as a dress designer. Although Celina gave her marital status as married, Hamilton (“Hall”) was now living with his parents in Denver, Colorado, and listed his marital status as single. By 1915, Celina had married again, this time to Inglis Edward Daniel Cameron. In 1900, Inglis had been living in Philadelphia with his mother Mary and his two older siblings; Inglis was sixteen years old. He is listed as a student in the 1908 Philadelphia directory. In 1909, he received his law degree from the University of Pennsylvania. In 1910, Inglis was working as a lawyer and living with his mother, sister, and niece. I don’t have a marriage record for Celina and Inglis, but their son Edward James Cameron was born on June 29, 1915. Eighteen months later, on December 19, 1916, Celina’s mother and Edgar’s wife Viola Barritt Nusbaum died at age 55 from chronic myocarditis. She was buried at West Laurel Hill cemetery. Two years later at age 60, Edgar remarried. His second wife was Caroline Saeltzer. She had been married before and was divorced. She was 52 years old when she married Edgar on October 24, 1918. In 1920, Edgar, Caroline, and Caroline’s mother Josephine were living at 3847 North 16th Street, and Edgar was now the head clerk for the railroad’s auditing department. 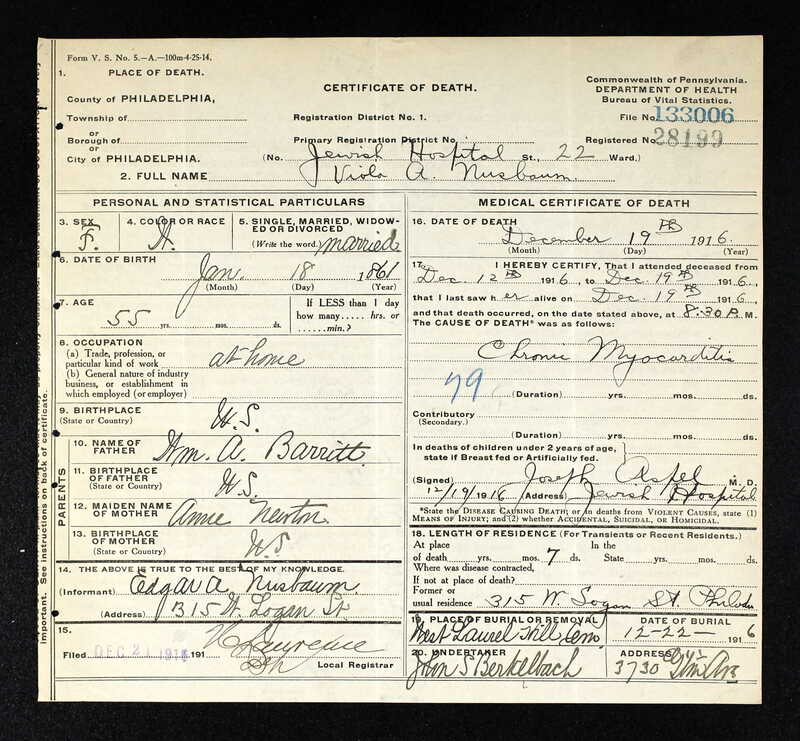 In 1920, Celina and Inglis were living with her daughter Marian, their son Edward James (listed as James), a niece named Ella (presumably Inglis’ niece since Celina was an only child), and a nurse at 7433 Devon Street in Philadephia. Inglis was practicing law. As listed in the 1921 Philadelphia directory, he was working for the Cameo Dress Company. In 1925 I found Inglis E.D. Cameron listed in the New York City directory with an office address at 100 East 42nd Street, but with an indication that his residence was still in Philadelphia. After that, things get really, really fuzzy for Celina, Inglis, and their children. I have not been able to find Inglis on any record after that 1925 directory—not on a census or in a directory or in a death record or obituary. Nothing. For such an unusual name, you would think something would appear. Nothing. I will keep digging, but at the moment I don’t know what happened to Inglis. Edgar Nusbaum died on May 14, 1924, from arteriosclerosis and bronchitis. He was 65 years old and was buried at Hillside Cemetery. His second wife, Carolyn, died at age 93 on November 10, 1959. She is buried with Edgar at Hillside Cemetery. This is obviously the right person—her parents are Edgar Nusbaum and Viola Barritt. She obviously had changed her name to Sally. And who was Carnes? And how did she end up in Houston, Texas? The informant was Marian L. Pattison, which gave me a clue about Celina’s daughter Marian La Rue Glessner. I was able to find a Sally Carnes married to a Donald Carnes in the 1948 Houston, Texas, city directory. 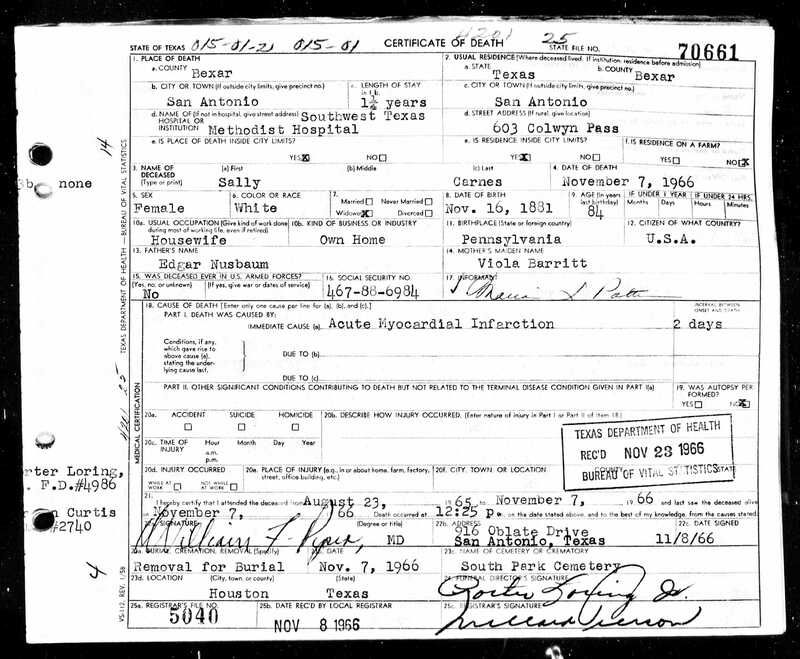 I also found a Texas death certificate for a Donald Carnes dated November 6, 1948. He was killed in a car accident in Houston. There is no mention of a wife’s name, although he was married. And the informant was his son E.J. Carnes of Pasadens, Texas. Donald Carnes had been a partner in Carnes Construction Company. Could E.J. Carnes, his son, be the same person as Edward James Cameron, the son of Celina Nusbaum and Inglis Cameron? Had Inglis died and had Donald Carnes adopted Edward James? In the 1942 Houston directory there is a listing for an Edward J Carnes, married to Margaret, working as a manager of the Carnes Service Station. Right above him in the directory is a Donald S. Carnes, a shipyard worker, but with a wife named Kath. The 1951 Houston directory lists an Edward J. Carnes, husband of Margaret, as affiliated with Carnes Construction Company and Carnes Neon Service. There is no listing for a Celina or Selena or Sally Carnes or for Donald Carnes. 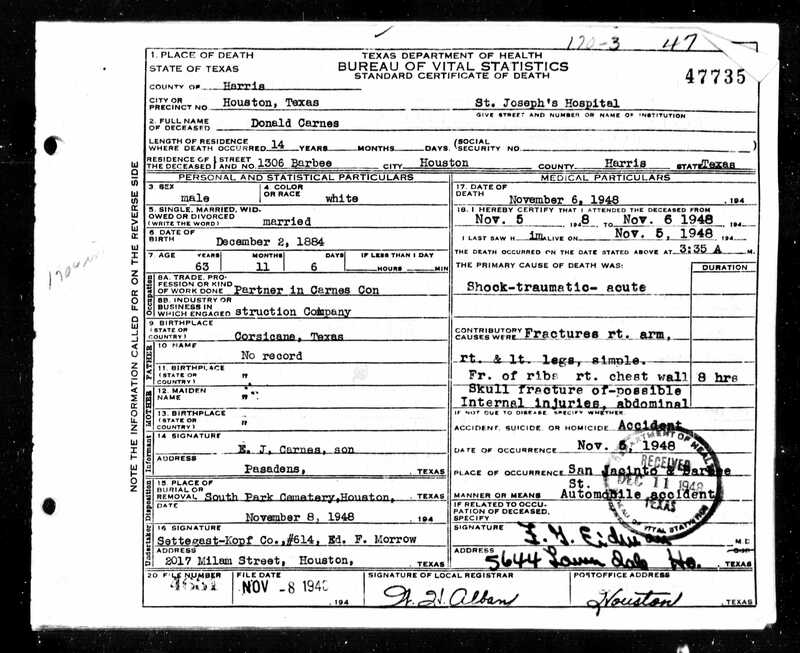 I think it’s pretty clear that Edward J. Carnes was the relative of Donald Carnes, given the death certificate and the similar business line. But was this Donald Carnes the husband of Celina/Sally Carnes who died in 1966? And was this Edward J. Carnes born Edward James Cameron, son of Celina and Inglis? I don’t know for sure. What do you think? I am still searching for more clues. 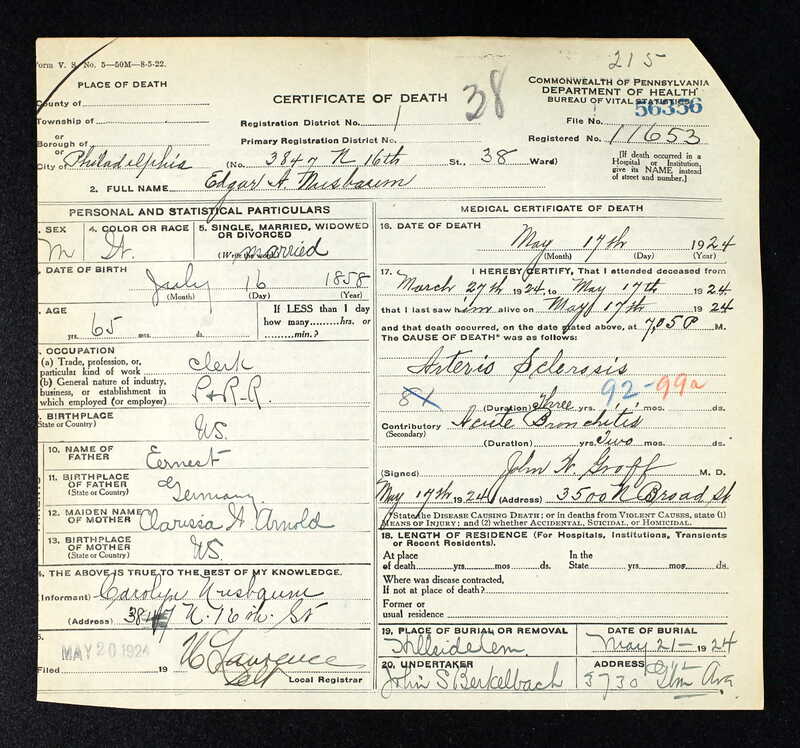 Since I knew from Celina’s death certificate that her daughter Marian had taken the married name Pattison, it was not that difficult to find her marriage record. According to that record, Marian Glessner married Carl T. Pattison in 1927 in Philadelphia. In 1930 they were living at 350 East Mt. Airy Avenue in Philadelphia. Carl was a civil engineer. His father was an English-born machinist in Philadelphia, and his mother was born in Germany. Carl, who is sometimes listed as Thomas C., sometimes as Thomas K., sometimes as Karl, and sometimes as Carl T. Pattison, was their youngest child. Strangely enough, Carl’s mother was also named Selina. Carl and Marian had two children born in the 1930s who I am trying to locate so that I can learn more. By 1940, Carl, Marian, and the children were living at 229 Sedgewick Avenue in Philadelphia, and Carl was now trading bonds. In the 1950 Philadelphia phone directory, he is listed as T. Carl Pattison at the same address on Sedgewick Avenue. I have no certain records for any of them after that. I have some possibilities, but nothing about which I have enough certainty to feel confident. I have found nothing for either of their children. Thus, the daughter and grandchildren of Edgar Nusbaum and Viola Barritt have proven to be quite elusive. Of all the descendants of Ernst and Clarissa Nusbaum, these have proven to the most difficult to find. That leaves me with one more child of Ernst and Clarissa Nusbaum to write about—their daughter Fanny. Sometimes spelled Selena, sometimes Lena, later Sally. 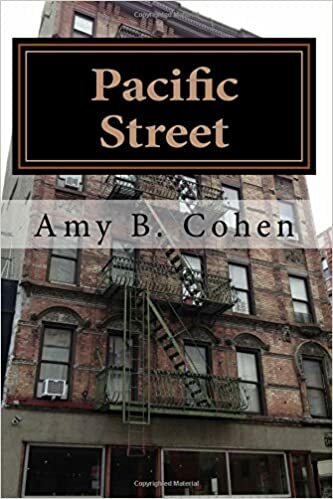 This entry was posted in Miscellaneous information and updates, Nusbaum, Pennsylvania, Philadelphia and tagged Houston, Nusbaum, Philadelphia by Amy. Bookmark the permalink. Celina sounds like a very interesting “story,” to put it mildly. I can see a novel shaping around her life. She does! And I am so frustrated that I haven’t been able to find out more….yet! There are so very intriguing gaps . . . I am Tracy Elizabeth Carnes, born in Houston Texas, the daughter of Edward James Carnes and Margaret Hannah Barnes. Edward James passed away June 22, 1984. He never told us about changing his last name from Cameron to Carnes but when an old friend, Ozzie Sears called us in 1999 as he was cleaning out his deceased brothers items, he asked me if we wanted the newspaper article about our father. I asked him to read it, and the article tells the story of Edward James Cameron, son of Donald Cameron, being a suspect in a robbery. There were checks stolen from a store that sold auto parts. Ozzie never sent us the article. We knew our father died with a family secret but didn’t know what it was until Ozzie called us. I contacted my father’s half-sister, Marian Pattison, to find out what this secret was, but she wouldn’t share anything at the time. My grandmother, Lena Claire Nusbaum (as listed on my father’s death certificate) or Sally Carnes, was a dressmaker. She had a knack for making fat women look thin and thin women look shapely. I stayed with her in Houston one summer for about a week, and she had dress forms, patterns she was making, and wedding dresses in the works. Mother (Margaret Hannah Barnes Carnes) told us that Sally had the patent on the metal slider that adjusts bra straps. She also designed a slip for Babe Didrikson Zaharias for golfing, called the “super-stride.” Mom and dad said that Sally Carnes had a line of clothing called, “Sally Smart” and four dress factories in Philadelphia lost during the depression. Sally also owned a Russian Tea Room. We don’t have any documentation to support these stories. My mother, Margaret Carnes, did not like her father-in-law, Donald Carnes (Cameron) and thought he was a lawyer for the mob in Philadelphia. Perhaps my father Edward James Carnes as a teenager was helping Donald with the theft. My grandfather Donald Carnes (Cameron) moved the family to Houston, Texas and must have changed the name from Cameron to Carnes. We can only assume that they took my mothers maiden name and changed the B in Barnes to C from Cameron. My mother Margaret Carnes was born in Youngstown, Ohio but raised in Philadelphia, Pennsylvania. She and my father Edward Carnes eloped, so they must have been married when Donald Cameron moved the family to Texas. I can’t tell you how grateful I am to read your blog. I’ve spent my adult life wondering about my heritage. I now have stage IV lung cancer and am doing well but would like to do some genealogical research to pass on to my nieces and nephews who all wonder about the mystery of the family tree. Thank you! Tracy, thank you so much for sharing this and for resolving one of the biggest mysteries I have faced in doing family research. I will send you an email a bit later as I am running out now. I am so sorry about your medical situation and am hoping that you are holding up well with the treatment. More later.